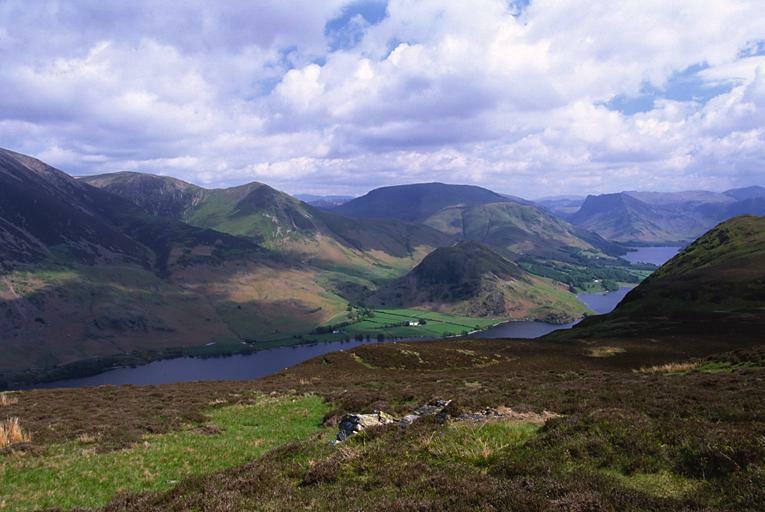 The slopes of Grasmoor, and summits of Wandope and Whiteless Pike, appear on the left. Helvellyn and Nethermost Pike, with High Spy in front of them, appear through the gap. Robinson lies beyond Rannerdale Knotts the lower-level fell on the shore of Crummock Water. In the distance are Rosthwaite Fell with High Raise beyond, seen through the gap of Honister Hause. Honister Crag looms above that to the side of Fleetwith Pike, beyond Buttermere. Grey Knotts, Brandreth and Green Gable complete the horizon beyond Mellbreak's south top. Smaller version of this picture.